My husband was watching a documentary of how shepherds handle sheep during lambing season. As the ewe goes into labor, inevitably one will give birth to a lamb who dies. The shepherd quickly pulls the lamb aside because the opposite is true as well, and a ewe may die during the birthing process. The logical thing in a human’s way of thinking is to put the baby lamb, whose mother has died, to nurse with the ewe who has lost her lamb, only the ewe will kill the lamb as it is not hers biologically. So the shepherd will skin the lamb who died and tie the skin to the lamb whose mother has died. 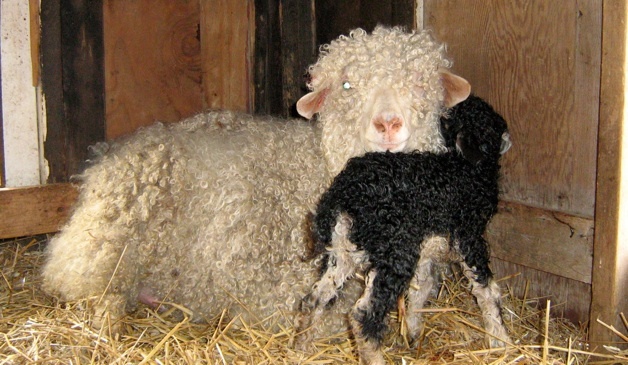 The ewe who lost her baby during birth smells the skin of “her” lamb and allows the lamb to nurse. Thus the lamb is adopted into the family. John 15:16 You did not choose me, but I chose you and appointed you to go and bear fruit–fruit that will last. Then the Father will give you whatever you ask in my name. John 16:25 “Though I have been speaking figuratively, a time is coming when I will no longer use this kind of language but will tell you plainly about my Father. 26 In that day you will ask in my name. I am not saying that I will ask the Father on your behalf. 27 No, the Father himself loves you because you have loved me and have believed that I came from God. How comforting to know that the Lord covered us in our nakedness and shame even when we had failed him so miserably because he loves us even when we behave so terribly towards him. How good it is to know that even today he’s made provision for us through His Son. Thank you dear heavenly Father for adoption and for the skin that hides our humanity and frailty. May we never take it for granted and may we recognize all that you have done for us.